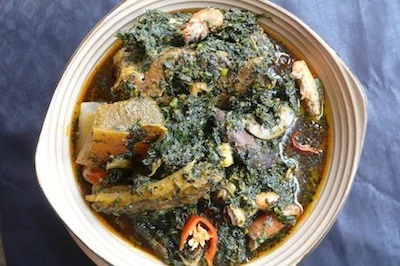 Edikangikong soup is a deliciously rich African vegetable soup, commonly served as a top delicacy during very important occasions. 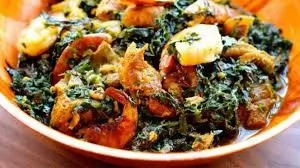 This dish is originally a South Eastern dish which can be prepared with various kinds of meats and vegetables, for this recipe, this article will teach you on how to prepare edikangikong with beef and ugu leaves or pumpkin leaves. Crayfish is another important ingredient in preparingedikangikong soup, it is as well a source of protein and gives the soup that crayfish taste. Palm oil forms the base of the soup on which the other ingredients are added to. Palm oil contains plenty of vitamin A. Then you put it off the fire and use your hand to squeeze out the oil from the palm nuts while it is still hot or at least warm enough to allow you dip your hands to squeeze out the oil from the palmnut. After squeezing out the oil from the palm nuts , you then remove or sieve out the residues,which is mainly comprised of palm fibers. 6. Tpo and tail the periwinkle and wash thoroughly. 7. 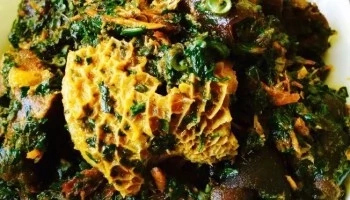 Add the snails, stockfish, dry fish, dry prawns and periwinkles to the pot of meat and cook for a further 10 minutes,adding more stock if required. 8. Finally add theshredded pumpkin leaves and water leaf and mix it properly. 10. Give it a good stir and gently simmer for 10 minutes, until well blended and the aroma fills the kitchen. 11. Remove from heat and serve with fufu or pounded yam.